Hey everyone! Today is the last full day with my parents. They're leaving tomorrow afternoon :(. I always enjoy their visits. It always feels like I'm on vacation when they're here. We go out to each every meal, do shopping, and do fun activities. It's nice. I live in tourist town, but I don't do the touristy things unless they're here so this has been a nice break from school and life. Anywho! This is Savvy Magic Pumpkin. This was part of the Femme Couture collection, and this color came with a handful of other sparkly top coats at Sally Beauty. This is definitely a color for layering. This is a sheer orange base with iridescent glitter that flashes gold and green. 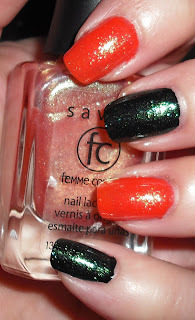 Here I have layered if over NYC Times Square Tangerine (index & ring finger) & WnW Black Creme (middle & pink finger). I love both of these looks. Magic Pumpkin on the NYC orange polish gives it a pretty more feminine sparkly color, while on the black gives it this vampy green shimmery color. I love it over black. I think this would look great for Halloween. That's it for today. I have done some hauling this weekend, so expect to see some haul photos Monday or Tuesday. I got quite a few LA Splash glitter colors I'm very excited about! Looks great. Love it layered on the black polish. I know how nice it is when parents visit. My parents live an ocean away. So I don't see them very often. They are coming next Summer. Can't wait. I love to have them around. Very pretty! I'm glad you got to have a good time with your parents. It's always nice to see your family. I really miss mine. Love your mani it's beautiful. Awesome! Can't wait to see what LA Splash colors you hauled. Looking forward to your LA Splash swatching.